Warner's latest live-action superhero romp will soar to Blu-ray and Blu-ray 3D combo packs this October. Early buzz around the net is reporting Warner Brothers will be bringing 'Green Lantern' starring Ryan Reynolds, Blake Lively, and Mark Strong to high-definition on October 14. 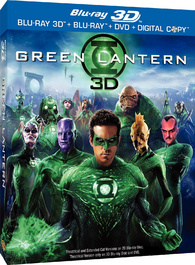 'Green Lantern - 3D' will also be available on the same date. The critically panned film based on the iconic DC Comics' character will be presented in its extended cut (Blu-ray 2D only) which supposedly will add about six more minutes of footage to the 114 minute theatrical cut. Specs have yet to be revealed, but supplements will include Deleted Scenes; Maximum Movie Mode with Picture-in-Picture; The Universe According to Green Lantern; Ryan Reynolds Becomes Green Lantern; "Justice League #1" Digital Comic; Preview of Green Lantern: The Animated Series; Access code for Sinestro Corp Batman Skin on the Warner Bros. Interactive video game Batman: Arkham City; and BD-Live. You can find the latest specs for 'Green Lantern' and 'Green Lantern - 3D' linked from our Blu-ray Release Schedule, where they're indexed under October 14.